The IOC President Thomas Bach said highlighted the successful organization and coordinated of the Olympic Games in Sochi amongst all participants. 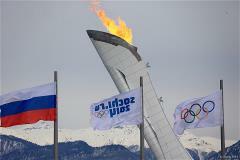 The XXII Olympic Winter Games in Sochi will end with a Closing Ceremony in the Fisht Olympic stadium. With just one day to go before the end of the XXII Olympic Winter Games in Sochi, the Sochi 2014 Organizing Committee has held a record 200 events, with an incredible 7000 athletes participating. The largest ever Observer Program to give the Organizing Committees of the Rio 2016, Pyeongchang 2018 and Tokyo 2020 Olympic Games an opportunity to assess first-hand the preparation and delivery of Olympic Games is rolled out at the Sochi 2014 Olympics. Sergey Shilov, Russian six time Paralympic gold medalist in Cross-Country Skiing and Sochi 2014 Ambassador, has delivered a workshop in Moscow to the international team of young journalists who had won a competition to become "Paralympic reporters". The Sochi 2014 volunteer team has been at the heart of the Games, drawing praise from athletes and fans for providing a warm welcome and spreading the Olympic spirit as they completed a total of 76,000 shifts by the half way stage of the Games. The Olympic Cauldron located in the heart of the Olympic Park, with its light show, music and fountain is attracting guests from across the Park. On February 14, 2014, in the middle of the Winter Olympic Games, the Russian Olympic Team Fans House, home to the country’s fans in the Olympic Park, hosted a cancellation of postage stamps. The stamps are part of a new series called "XXII Olympic Winter Games of 2014 in Sochi: Olympic Winter Sports". As the Sochi 2014 Olympic Winter Games reach the half way stage, the Organizing Committee have provided an update on the “truly great Games” in progress. Since the start of the Olympic Games in Sochi, as part of the Sochi 2014 Cultural Program, the host city has staged over 140 various events participated in by 92 creative groups from all over the country. In total, more than 185,000 guests visited the Live Sites across Russia, where 118 events took place.